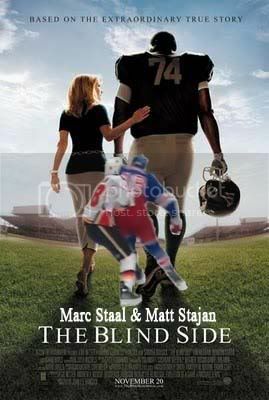 Kerrzy's Notebook: Kerrzy's Notebook: The Blind Side? After dishing out a pair of suspensions last week amid an email scandal involving his son, it’s right back to work for Colin Campbell. The NHL’s executive vice president and head disciplinarian will definitely be taking a look at a hit by New York Rangers defenseman Marc Staal on Calgary forward Matt Stajan from Monday night in a 2-1 loss for the Flames. In my opinion, it’s an important decision for Campbell, because it will test the boundaries of the league’s new “blindside” and “headshot” rules. One problem that a lot of people, myself included, have with the NHL’s justice system is that it seems to be all over the place. Incident A will look near identical to Incident B and Incident C, but only one will result in a suspension. For example Pittsburgh’s Matt Cooke, a blindside expert, was suspended for this hit and not this one, despite striking similarities. In fact, both hits are included in the NHL’s 2010-11 Rule Enforcement Video, which is slightly ironic. As Stajan is moving forward, Staal is coming across the ice, approaching him from the right side (remember, he is looking left). Staal appears, to me anyway, to hit Stajan with a shoulder to the head while the player is looking away. After the game, Rangers coach John Tortorella told ESPN he thought it was a “clean” hit and Staal said he was just finishing his check. Let me just say that I don’t think it was “dirty” or that Staal was trying to injure Stajan. I just think that, within the new rules, it’s one of those hits that the league is trying to outlaw. You’ll notice in the wording of the rule that lateral hits targeting the head are not allowed. If you listen to the Staal/Stajan clip with the volume up, you’ll hear the announcers saying that the Rangers defenseman was clearly going “North/South” when he delivered the hit, which would make it okay according to the rules. The problem is, he is clearly skating along the blue line (East/West)! Further to that, it looks to me as though Staal makes contact with Stajan’s head, another no-no! Two of the comparable hits from the Rule Enforcement Video are Mike Richards on David Booth or Michael Haley on Rod Pelley (1:15 into the clip), while a similar type of hit from this season would be Shane Doan on Dan Sexton, a hit that saw the Phoenix captain sit out for a few games. Is this a hit that falls under that new set of rules, or was it a clean hit that Matt Stajan should have seen coming? Despite what appears to be overwhelming evidence against Staal, TSN reports that the NHL has reviewed the hit and it was deemed legal. The Calgary Herald agrees with my view that it seems to go against Rule 48, while others say Stajan should have seen Staal coming. I love the NHL's wheel of justice!